Mark's Tickets is the best place to find tickets for Toronto Maple Leafs fans. Just check this page for any new events or schedule updates throughout the year. We sell tickets to every Toronto Maple Leafs game around the world. We know how passionate Toronto Maple Leafs fans can be about hockey, so we make sure to have hundreds of tickets for every game available right up until it starts. For those looking for cheap Toronto Maple Leafs tickets, we offer tickets starting at very low prices (many times below face value). We offer tickets in most sections of every venue that you can see Toronto Maple Leafs. Simply choose the city or venue that you are interested in below, and you will be able to see all of the available seats. Do not forget that Marks Tickets also specializes in sold out Toronto Maple Leafs tickets. 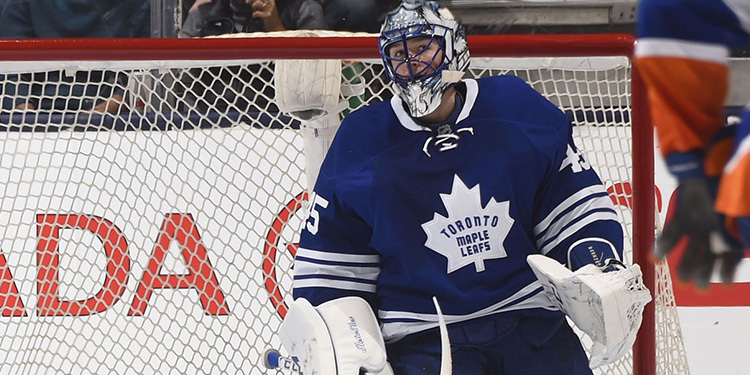 No longer will sold out shows prevent you from seeing Toronto Maple Leafs. The Toronto Maple Leafs are a professional hockey team that plays in the NHL. The Maple Leafs play their home games at Air Canada Centre in Toronto, Ontario. With 82 games per year, and 41 being home games, The Toronto Maple Leafs (officially the Toronto Maple Leaf Hockey Club) is a professional ice hockey franchise based in Toronto, Ontario, Canada. They are members of the Atlantic Division of the Eastern Conference of the National Hockey League (NHL). The team is one of the "Original Six" league members. As of 2012 they were owned by Maple Leaf Sports & Entertainment, Ltd. and are represented by chairman Larry Tanenbaum. Their general manager is Dave Nonis. Their head coach is Randy Carlyle. In 1999 they moved to Air Canada Centre, which replaced Maple Leaf Gardens, their home since 1931. The franchise was founded in 1917, operating simply as Toronto and known today as the Toronto Arenas, as it was operated by the Toronto Arena Company, owners of the Arena Gardens arena. In 1919, the NHL transferred the franchise to new owners who christened the team the Toronto St. Patricks. The franchise was sold in 1926 and was renamed the Toronto Maple Leaf Hockey Club. The team colours are blue and white. The Maple Leafs have won thirteen Stanley Cup championships, second only to the twenty-four championships of their primary rival, the Montreal Canadiens. They won their last championship in 1967. The 45-year drought between championships is currently the NHL's longest. With an estimated worth of US$1 billion in 2012, the Leafs are the NHL's most valuable franchise, followed by the New York Rangers and the Montreal Canadiens, respectively.